This page describes our progress on this award. The most recent information is at the top of the page. For background scroll down to the first post. After a discsusion with the Pamoza board, it was decided that implementation of this project should wait until May 2013. 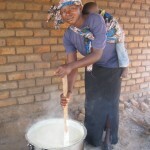 The award was granted mid way through 2012, but the funds arrived near the end of the year and the rains were already well underway – more importantly, as it doesn’t matter what day or minute it is, you can always start better nutrition – Pamoza also had a very tight schedule of events and we were afraid the school would become overloaded, potenially setting them up for failure. Initial discussions and preparation are taking place, then there will be a board meeting in May and plans should roll out from there. 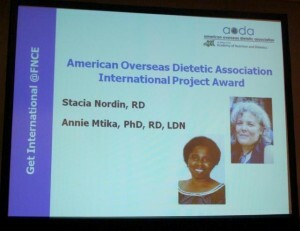 The American Overseas Dietetic A ssociation awarded Annie Mtika and me (Stacia) with a 3,000 USD award as part of their International Project competition. We created a proposal describing how we will support the development of Sustainable nutrition approaches at a primary school – and, now we get to do it! We are both nutritionists but we’ve switch countries – Annie lives in my country (USA) and I live in her country (Malawi). With the award, we are going to help a school in Annie’s home community over the next 2 years to improve their nutrition. The money will be used to open the school communities eyes to the available solutions through facilitated exchange visits, to bring in facilitators who are already successful to help them understand how they can better use their own resources. 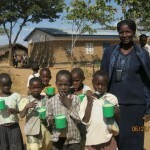 Kahelere Junior Primary School is located in Euthini, Mzimba, a rural area in Malawi. The school enrolls approximately 220 children from grades 1 to 5. Most of these children come to school without breakfast or snacks, which affects participation in class sessions and regular attendance in school. This problem is partially being addressed by the school meals program, which is run by the community of villages surrounding the school. The program is financially supported by Pamoza International www.Pamoza.org, an organization based in the U.S. but operating in Malawi. The nutrition program involves growing food crops that are used for making a meal at schools and for selling any surplus produce to reinvest in the program. This goal is in line with the Ministry of Education’s School Health and Nutrition (SHN) Strategic Plan and Guidelines (2009-18) (link takes you to dropbox), specifically working towards scale up of the Home Grown School Meals. Unfortunately, the current support from Pamoza and the government is not helping the school to produce enough food crops to sustain the program. The school is looking for funding to increase and diversify their food production through gaining skills in sustainable food and nutrition security, school meals management and nutrition education.